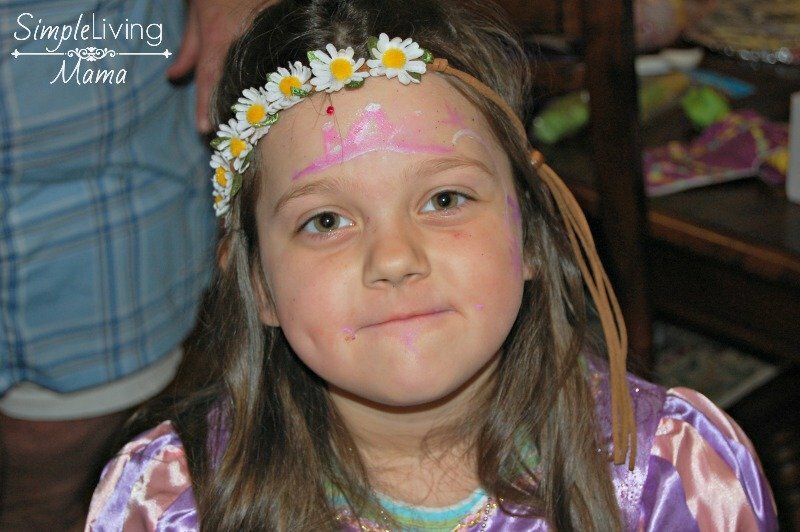 My oldest daughter turned six a couple of weeks ago. 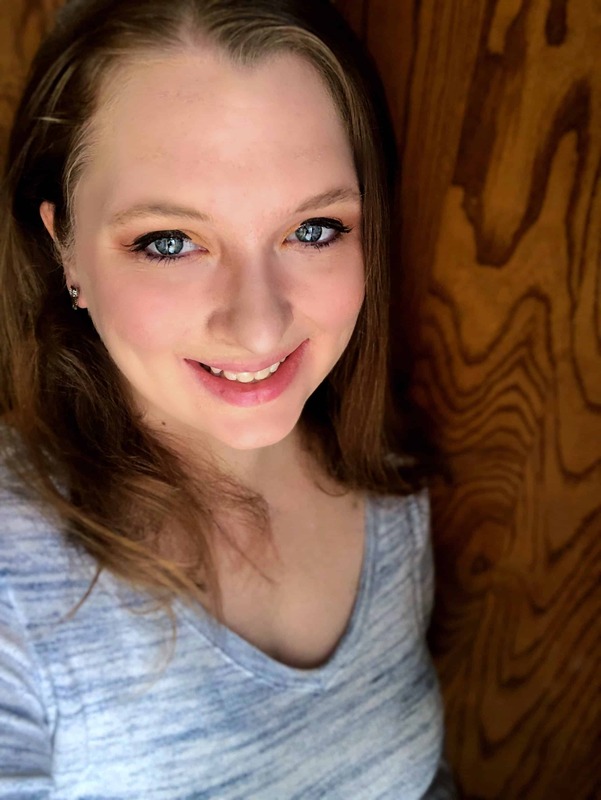 I can’t believe how fast the years are flying by! 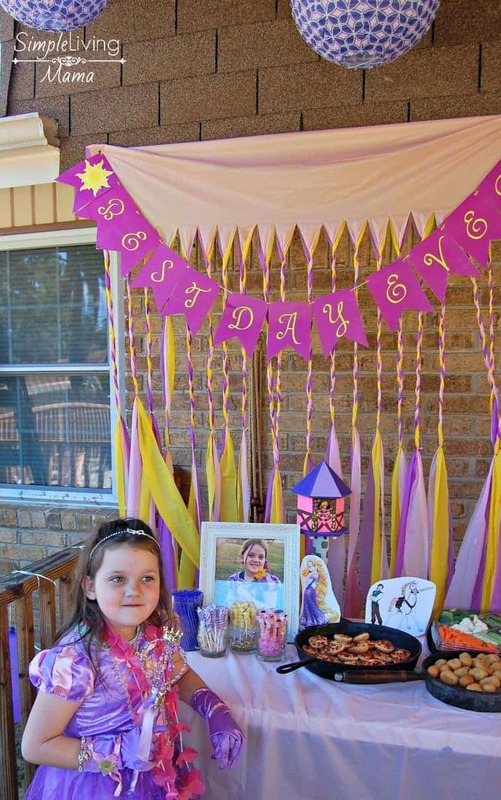 Her favorite movie of all time is Tangled and her favorite princess is Rapunzel. 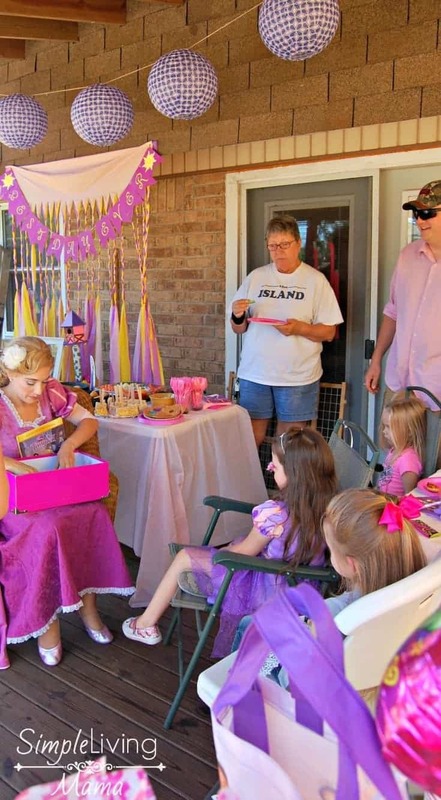 She has been begging me for a Rapunzel Tangled birthday party for at least a year now. 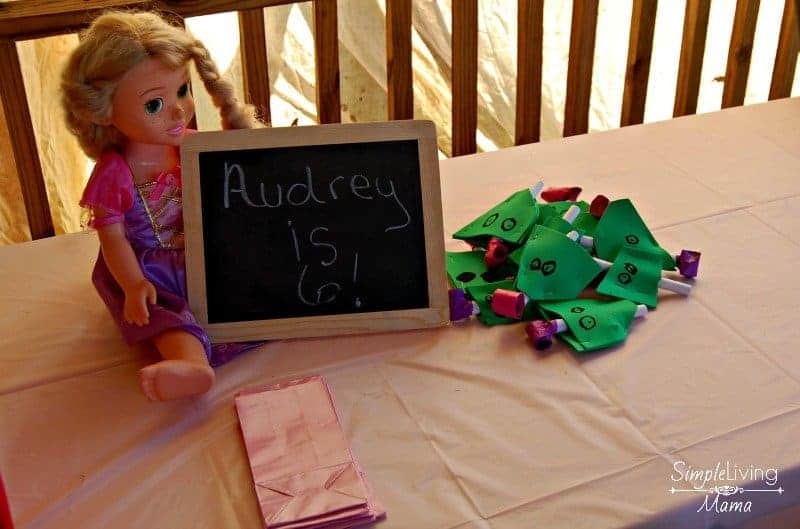 I decided we just HAD to make that happen for her this year. 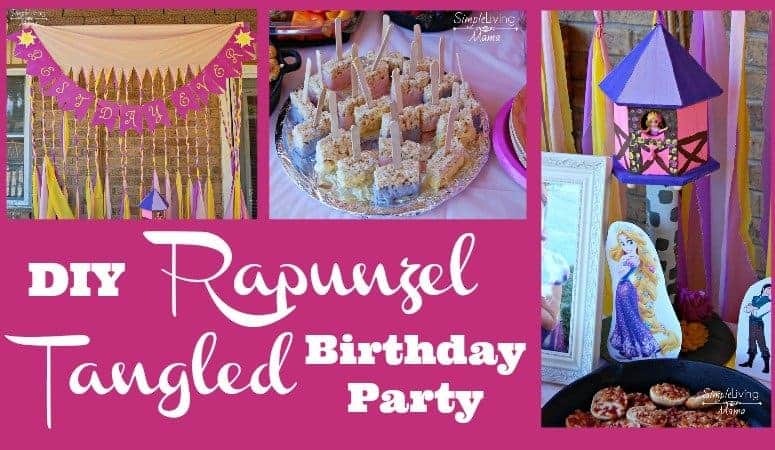 I want to share with you how we DIY’d her Tangled birthday party! So, here’s a little look at the food table. We used my grandparents’ patio as the party space. Here is the backdrop. It was a pretty simple and cheap project. 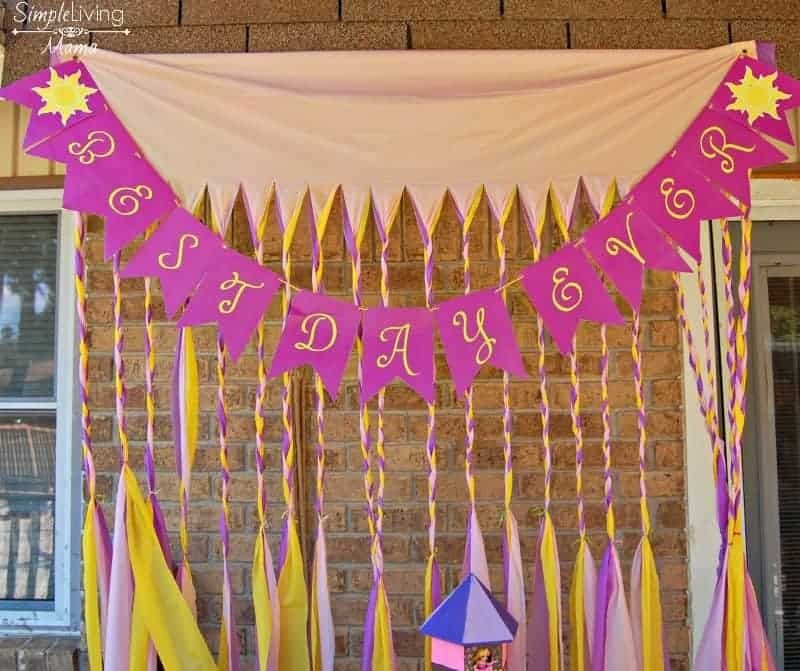 We got three table cloths from the Dollar Tree in the colors of the party. We hung them up, cut strips almost to the top, and braided the strips about a third of the way down. 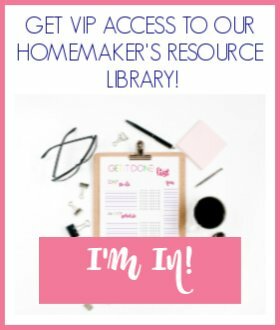 I made the banner myself using PicMonkey. Of course, it says “Best Day Ever,” which is one of the phrases from the movie. I took a picture of Sis in her Rapunzel dress and framed it for the table. I printed some Tangled clip art onto card stock and also used that on the table. We served food in skillets because skillets are a main theme in the movie. 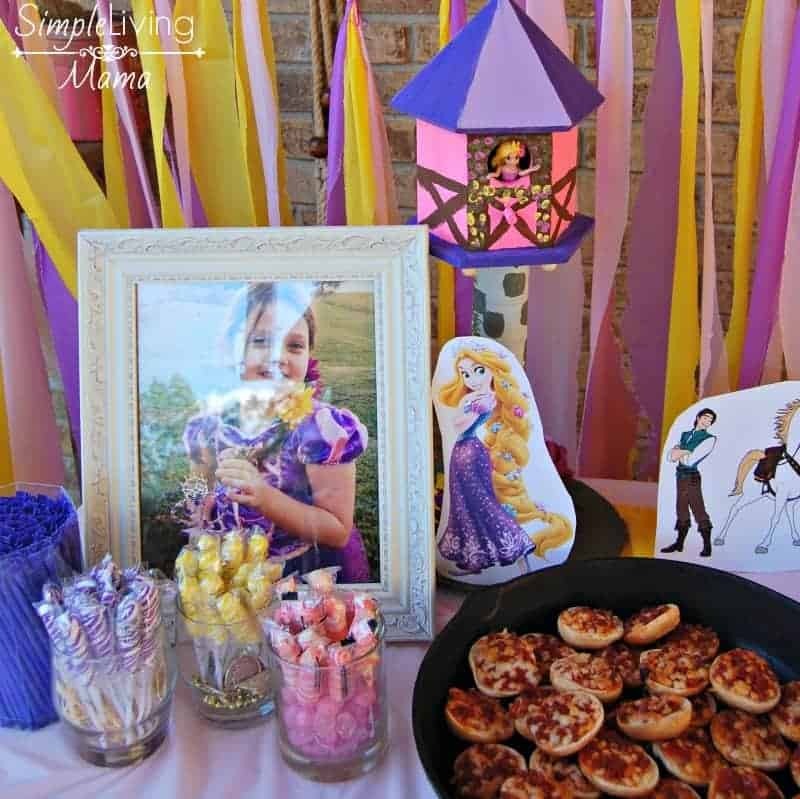 We also displayed candy in the party colors of pink, purple, and yellow. Here is another look at our table set up. We kept the food simple. 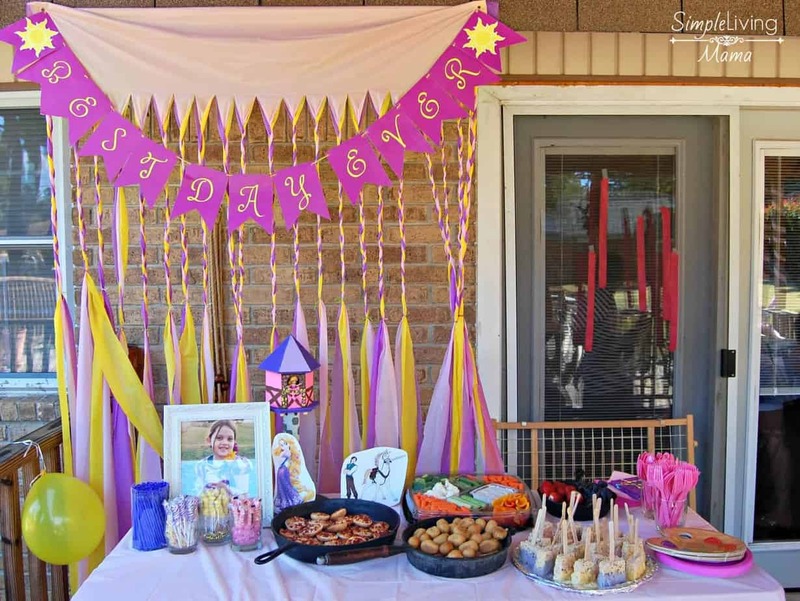 There were Bagel Bits and mini corn dogs from Sam’s, as well as a veggie tray, and fruit. 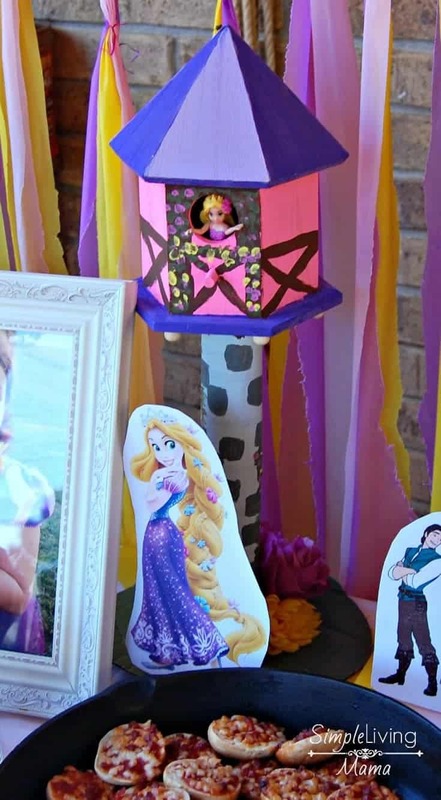 Here’s the DIY Rapunzel tower that I made. I painted a wooden birdhouse I bought from Walmart and hot glued it onto a paper towel tube that I also painted. I think a Pringles can would have worked better as the tower piece for this size bird house. The base was simply a circle cut out of cardboard and painted green and decorated with some silk flowers. This snack was probably the biggest hit. 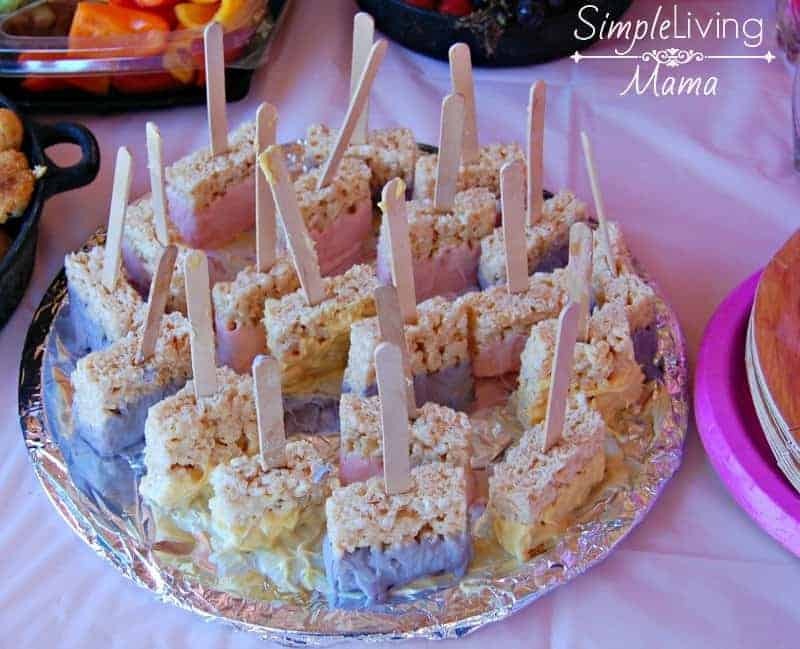 We simply used store bought rice krispie treats and dipped them in some melted almond bark that was colored with food coloring. They are made to look like paintbrushes. Afterall, Rapunzel is an artist! Here’s a look at our kids’ table. We have little Pascal blowers made by my son, and one of my daughter’s Rapunzel dolls. The kids got their own paper crowns to color while they waited for the main event! And here she is! We got a visit from Rapunzel herself! 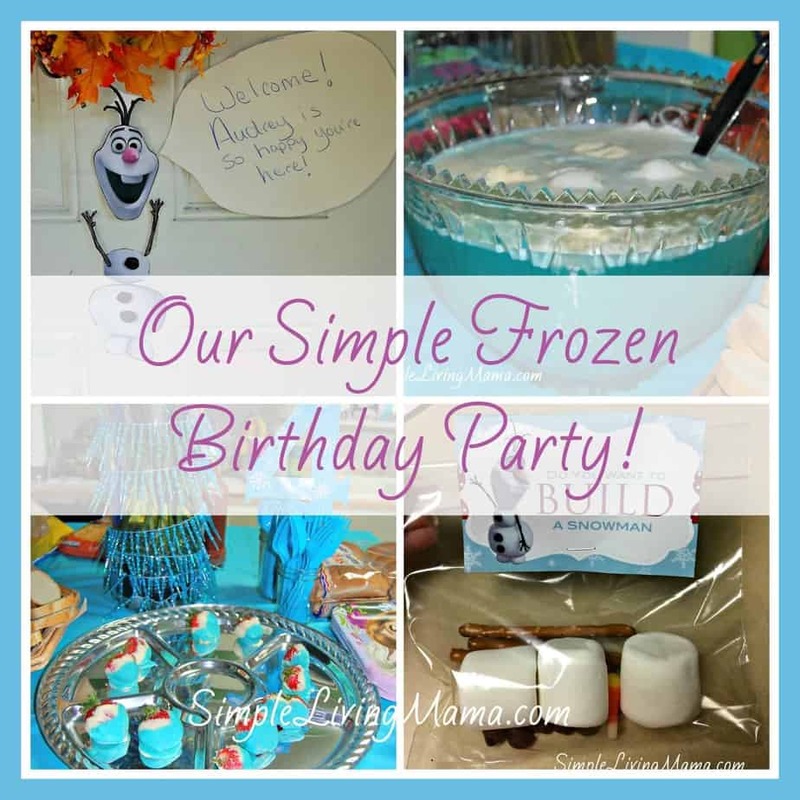 If you’re local, we used Fancyful and we were very pleased! 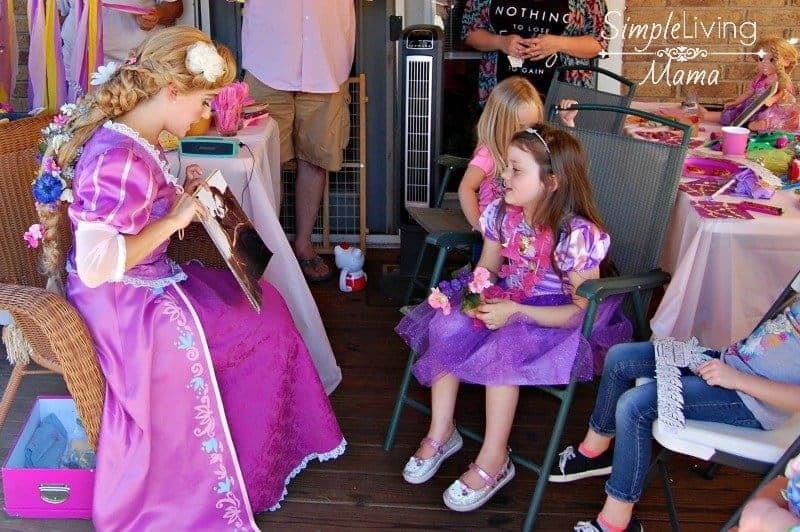 Rapunzel came and gave our birthday girl some flowers, she read an interactive story, she sang, and did face painting! Sis loved the story. She could answer every question Rapunzel asked! Haha! 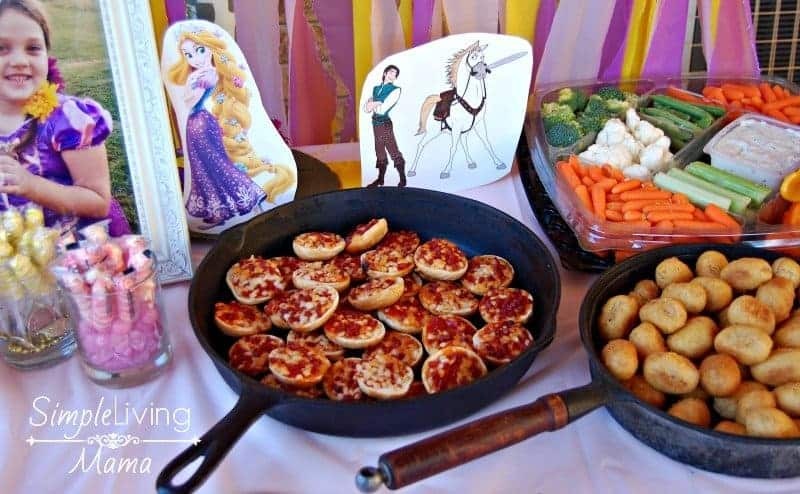 Here’s another look at the food set up and my mini Rapunzel. 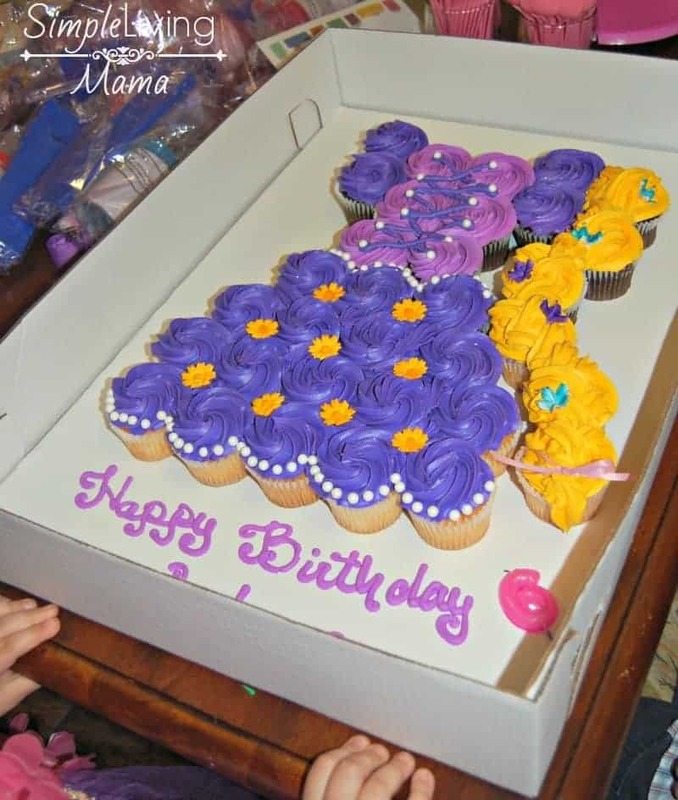 The cake was made by a local grocery store. Isn’t it gorgeous? 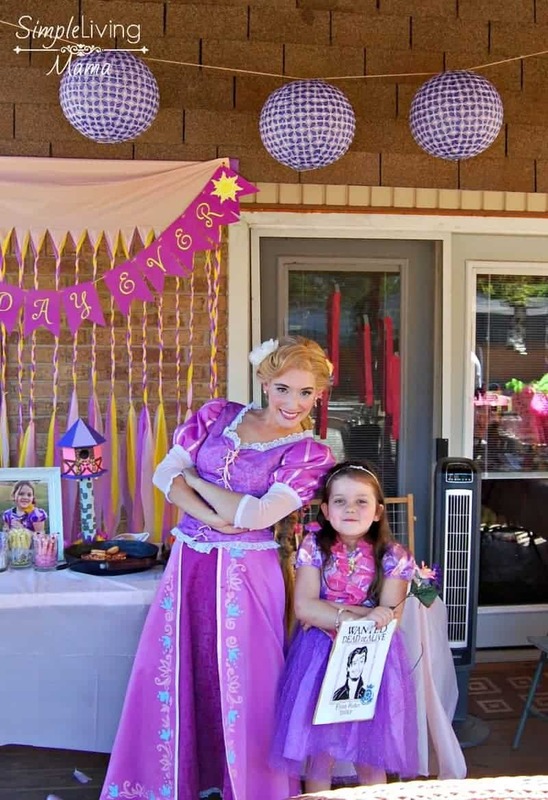 Rapunzel and the birthday girl! Haha! 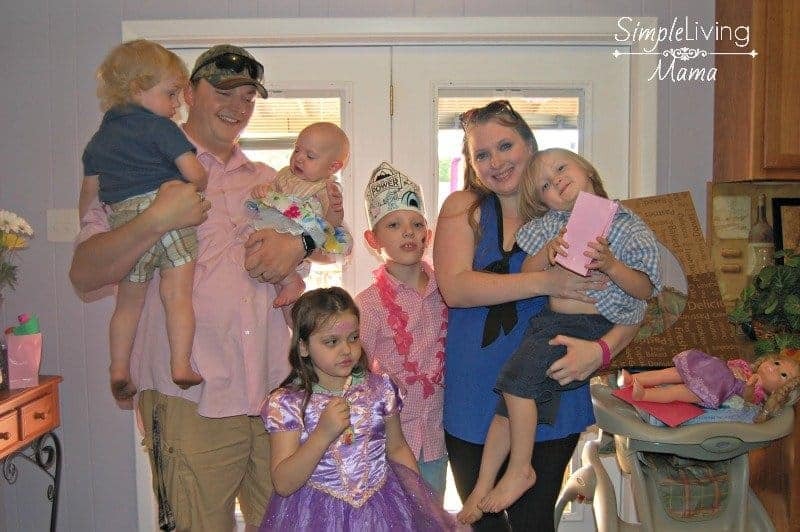 The best picture we could get of our entire family! We ended the party with a pinata from Walmart. Here’s the birthday girl! I think she had the best day ever!